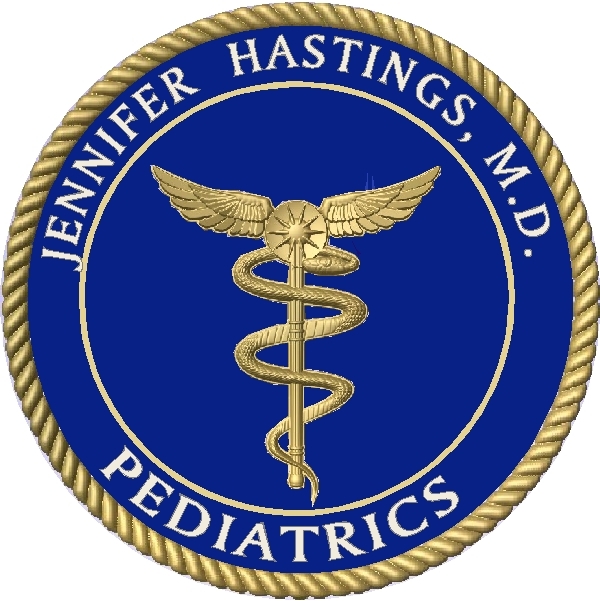 This blue sign with gold-leaf border and carved (3D) caduceus (also in 24k gold-leaf) is made from high density urethane (HDU) which has been sandblasted, CNC routed, and painted with the physician's name and name of the medical specialty, Pediatrics. This body of this sign would also be attractive in black, burgundy or in a vibrant shade of green. This is one of over 120 medical doctor and other Health professional signs and plaques and one of over 7000 different custom sign and plaque designs displayed in 44 indexed and organized photo galleries on this site. To see other styles of sandblasted or engraved 2.5-D, or premium carved 3-D High-Density-Urethane (HDU) signs and plaques for other medical offices, clinics, hospitals, physicians, nurses, optometrists ,chiropractors, pharmacists, psychologists, counselors, and other health care professionals, please click on Gallery 11 - Medical and Health Professional Signs and Plaques. For information on design options, prices, and delivery schedules, please call 951-698-8484 or email us at info@artsignworks.com and our friendly and knowledgeable Customer Service Representatives will respond promptly. We welcome casual inquiries.